Paul Manulik, Director, Princeton String Academy, and his wife Lindsay Diehl, just returned from a 2-week volunteer stint at the CEMUCHCA Music Camp in Cap Haitian, Haiti, where they report Suzuki music education is alive and well but with a delightful Haitian flavor – a flavor of community and spirit. The camp is run by the CEMUCHCA Music Institute (Circle of Christian Musicians of Cap-Haitian), with headquarters in Cap Haitian, a quaint colonial city reminiscent of New Orleans’ French Quarter. 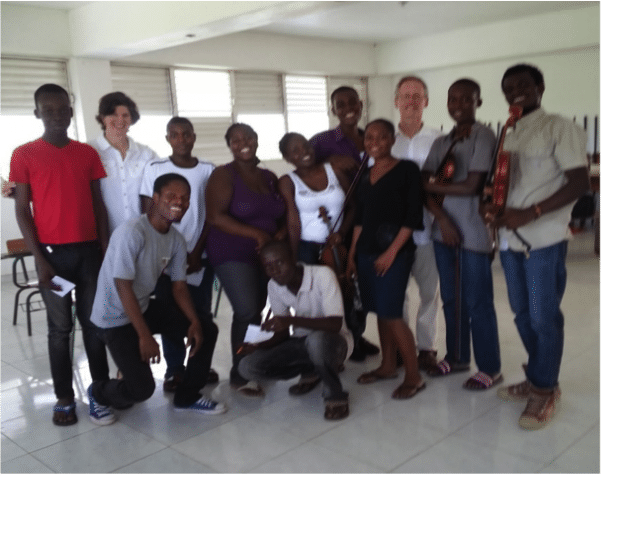 Founded in 2004, CEMUCHCA offers music instruction year round and also offers a 3-week summer camp, drawing 200 students from all over Haiti. The teachers include Haitians and some foreigners mostly from the US but also from other countries such as Denmark, Brazil, Cuba and the Dominican Republic. This year, the camp was held on the grounds of Saint Barthelemy School an impressive primary and secondary school founded and run by Father Bruno, an Episcopal priest. Just outside the school, in the town of Terrier Rouge, they were struck by the lack of development, with dirt roads and central water pump but were also impressed by the community, a community that worked well together to maintain order and have an active social life. The “Haitian flavor” was in full swing at the camp. Learning was a communal effort there with most classes and lessons –even private lessons – held outside in the central courtyards. Private lessons of all instruments –from brass to strings–were held concurrently and it was not uncommon to have violin lessons a few feet away from string bass, cello, and piano lessons. Brass instruments usually practiced in the other courtyard. The students were very engaged with each other, in the spirit of community, and were always helping each other out. The self- motivation of the students – with constant requests for lessons—was refreshing. In addition to teaching private lessons and leading violin orchestra sectionals, Mr. Manulik also taught a Teacher Training Course for Suzuki Books 1 and 2, with his wife as translator. Lindsay also taught English and beginning piano. Before leaving Haiti, the couple had an opportunity to visit some charming visitor sites in and around Cap Haitian, including Cormier Beach, a well-groomed, white sand beach with Caribbean blue waters, and the Roi Christophe Hotel, a charming old colonial hotel in the center of town. To “cap” off their trip, they met a group of 15 Canadian chiropractors at the hotel and had a delightful time sharing stories and trades (musical performance for body adjustments- a good trade indeed) and engaging with each other in the spirit of Haiti, with communal spirit. They hope that some of the Haitian flavor rubbed off on them and will be with them until their next visit. A bientôt Haiti! For more photos and information about our trip or to make a donation to CEMUCHCA music camp, please visit our website www.stringacademy.net or contact Mr. Manulik directly, paul.manulik@stringacademy.net.